I always make my own chicken soup. It is delicious broth. I usually make a few batches and freeze them because it’s a great thing to have frozen in quart containers as stock and will last for up to six months frozen. 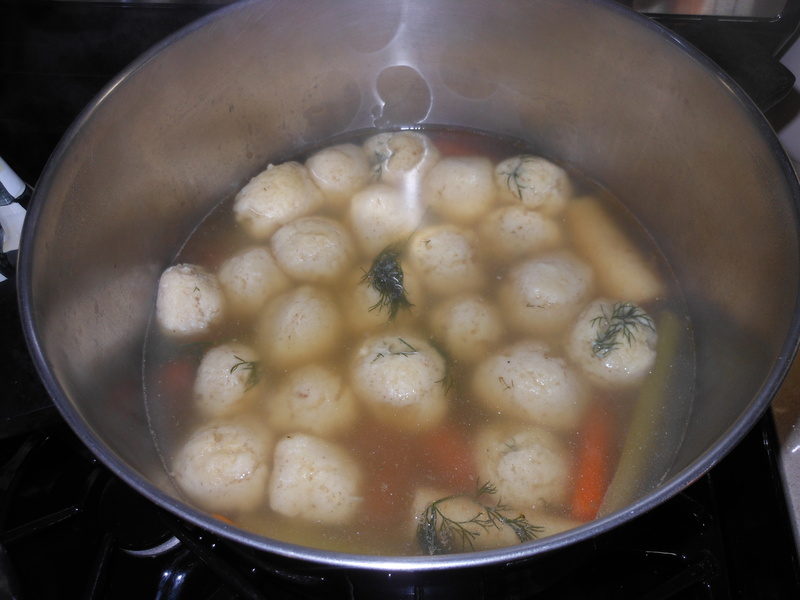 When the holidays come—whether Rosh Hashanah or Passover—I always make my chicken soup with matzo balls. I make the soup a day ahead and skim whatever fat is on there before adding my matzo balls. Keep reading for my “secret matzo ball recipe”. I place the chicken, chicken wings, onion, carrots, celery, whatever herbs I’m using, garlic, salt and pepper in as large a pot as I can find (usually about a 16-20 qt. stockpot.) Add cold water to cover chicken by at least 2 inches above the chicken but not to the top of the pot because it will boil over (very messy). Bring to a boil and then simmer, uncovered, for about 3 hours. I skim the soup skum (sounds lovely) off for the first half hour or so—after that, you shouldn’t have much more. I remove the chicken from the broth after an hour or so, because it is cooked and it will taste like a rubber chicken if you plan on eating it. Sometimes, I like to shred it and return it to the soup. If you are not using the chicken (what a waste of good chicken), just leave it in. It will fall apart in there. I leave the wings and discard them at the end of the 3 hours. Next, I strain all of the soup, discard all remnants, fill my containers and put in the fridge. 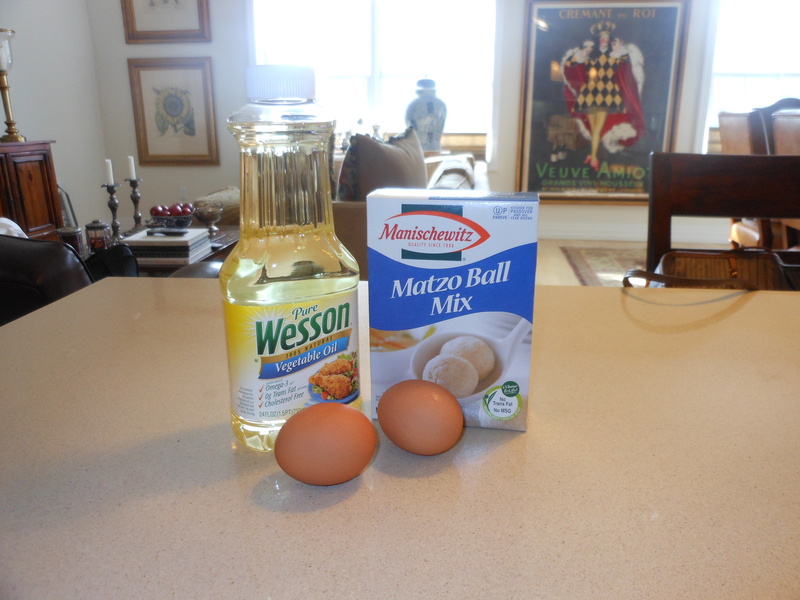 The next day (or the day of the holiday), I usually skim off the fat that has risen to the top and make my matzo balls (recipe below). This has always been my secret, but now it’s out. Okay, I own it. After years of making matzo balls from scratch, my mother (yes, my mother, the cook) turned me on to Manischewitz boxed matzo ball mix! It just wasn’t worth it. My balls weren’t as consistent as I would have liked, whereas these are always perfection! Light and fluffy and everyone always loves them. No sinkers here! I follow the directions on the box carefully. They sell just the mix box. You will need vegetable oil and 2 eggs per box. I do add a little piece of dill inside each ball, but that’s it! Now my secret is out. Sometimes this is really the only way to go. It saves time and ingredients and is really good. No MSG or trans-fats either! So make the soup, cheat with the balls, and enjoy. There is no substitute for homemade chicken soup, though.